The S22F350 is a 22″ compact and slim monitor that will work well for anyone with a small space to fill. It is only 11mm thick which is pretty impressive. Whilst there is a game mode on this model it is far from what might be described as a gaming monitor. If you are a serious gamer you’ll probably be looking for something bigger anyway, 22″ is too small to enjoy in my humble opinion for what that is worth. The 22″ version of this range does not come with FreeSync, but there are larger models that do. I would seriously consider the 24″ version S24F350. But if you are fancy a good looking low cost small monitor for casual use then read on. The Samsung S22F350 is actually a smart looking screen given the price, slim stylish bezel and an overall compact build, I wouldn’t be ashamed to display this in my home study. The slender design gives an extra feeling of quality even if this is a essentially a budget display. The monitor has two HDMI inputs only so make sure you have a compatible socket on your video card. There are no speakers or headphone socket which means this monitor might not be suitable for hooking up to a DVD player or console unless you have a way to get sounds out other way. 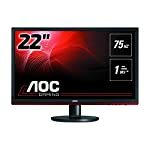 I’ve not seen this monitor and there aren’t many professional reviews around but reading through the Amazon owner reviews I can see that people who have bought it report back good overall performance. It seems good enough for casual games and day to day computing. Of course this is never going to compete with a more expensive professional screen but you aren’t paying for that are you. The TN panel is always going to have limited viewing angles, colour accuracy deteriorates as you move you head from side to side or up and down. But this is a limitation with the technology and unless you want to pay more. We give the Samsung S22F350 a 4.5 out of 5 rating. Want to know what existing owners of the monitor think? You can read real user reviews here. Should I buy the Samsung S22F350? The Samsung S22F350 is a small 22" monitor that will be great on a small desk. It's a small size for gaming and productivity but perhaps that's what you need. At least it won't break the bank If you are having some doubts about this purchase then why not read some real owner reviews and see what other buyers think. Welcome to the Samsung S22F350 FAQ. This section attempts to answer common questions you may have, please get in touch if you have any more queries or if you think our answers need updating. How can I get sound on this monitor? You can’t. No speaker socket, no headphones. You’ll need to plug your external speakers or headphones into your PC. The 22″ version of this monitor does come with Freesync, it says it on it’s product website but not described on Amazon’s page. Please do more research before creating a review as that is misleading customers in the wrong direction who may be missing out on a nice budget monitor. Hi Michael, I always appreciate feedback and as we are an amateur fan website mistakes can be made. But I’m afraid that in this case I don’t see anything to suggest I am wrong on this. As clearly stated in my overview, FreeSync is available on the 24″ and 27″ models but not the 22″. But do please let me know if Samsung state this is not the case elsewhere. I will gladly update my post and let Samsung know of their mistake. I try to make the amateur nature of this website clear in a number of places on the site, I do not wish to mislead anyone. In fact I am proud of the site’s independent nature. I built the site whilst researching my own monitor purchase as a way of tracking which were worth a further look and the goal is really to provide summaries for those who do not have the patience for “in depth” reviews. Some people just want to know “is this monitor right for me?”. All feedback is welcome, especially when I have actually messed up, so thanks again for posting this, it really is appreciated!